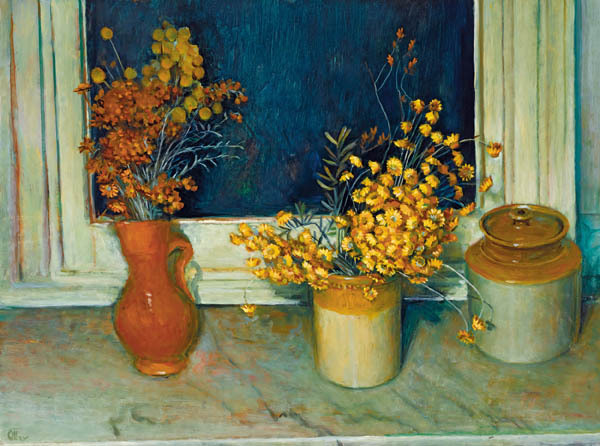 Margaret Olley is one of Australia’s most well-renowned painters of the still-life subject. Her legacy to Australian art history is significant and her characteristic interior scenes are highly regarded and collected worldwide. Throughout her long and successful career, the still life was the focus of her artistic production, eschewing the trends which were engaging her contemporaries in favour of the thoughtful, harmonious domestic scenes which became her unique oeuvre. Olley was born on the mid-North coast of New South Wales and spent much of her childhood in Queensland, later attending Brisbane Central Technical College to follow her interest in art. In 1943, Olley moved to Sydney to attend East Sydney Technical College and it was here she forged strong friendships with Donald Friend (1915-1989), Justin O’Brien (1917-1996) and David Strachan (1919-1970) which would shape and influence her career. During the early 1970s, Olley would use her friend, and fellow artist, David Strachan’s house as a studio after he tragically died in a car accident. The present work is painted in Strachan’s kitchen at night and relates closely to two other works that also feature the dark evening sky seen through the window; Interior Night 1972 and Kitchen Still Life with Fennel 1975, both in the collection of The University of Queensland, Brisbane. Floral subjects underpin the artist’s best and most collectible works and have featured throughout Olley’s oeuvre. In the present work, the artist chose everlasting daisies, a native Australian variety of wildflower which is known for its attractive, brightly coloured paper-like petals. Here, the artist chose golden yellow daisies as the focal point of this tableau, which is offset by the dark window behind. Olley’s innate ability to create compositions that were spontaneous yet ordered is a hallmark of her best still-life paintings. Here, earthenware vases in subdued tones are juxtaposed against the vividly coloured daisies which draw the eye to the centre of the compositions. Native Australian wildflowers were favoured by Olley and feature in many of her best-known still life paintings of the 1970s, such as Late Afternoon of 1972 in the collection of the Art Gallery of New South Wales, Sydney; Hawkesbury Wildflowers and Pears c1973 and White Still Life 1977, both in the collection of the National Gallery of Australia, Canberra.